Walk in the footsteps of early Independence residents, and experience western expansion, the Civil War, outlaws, pioneer settlers, and Harry Truman. A one-hour tour of the historic Independence Square takes you to places and events of the past. Please meet at the Main Street Coffee House. Celebrate Earth Day with Terra! Celebrate Earth Day with Terra Health & Wellness Market. April Super Day at Terra! Super Day at Terra Health & Wellness Market. SAVE BIG! Join us for a Ribbon Cutting for the new TCC (Verizon Authorized Retailer) store located right off of 39th street! Join us for a Ribbon Cutting for the new and delicious Cherries Ice Cream Bar on 23rd Street! 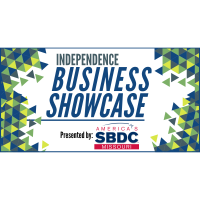 Be sure to join us for the Monthly Membership Luncheon and Business Showcase! Join us for a Ribbon Cutting for the new Blue Ridge Bank branch on the Independence Square! Join as at the first ever Chamber Mini Golf Tournament! Join us for a Ribbon Cutting for Osborn Global Investment's new office at the Bridge in Downtown Lee's Summit! Join us for an afternoon of activities, raffles, food & drinks, and so much more! We would love for you to stop by and help us celebrate our 25th Anniversary of doing business. We look forward to seeing each and every one of you! Join us for our member appreciation day! Join us for a Ribbon Cutting for KC Cajun's food truck right here in the Chamber parking lot!